Look out, sleepers, there’s a new Casper product in town (and it’s much smaller than a mattress). Introducing the Casper Glow — the bed-in-a-box brand’s very first nightlight. Now, some of you may be thinking, “But aren’t nightlights for kids?” Well, yes and no. 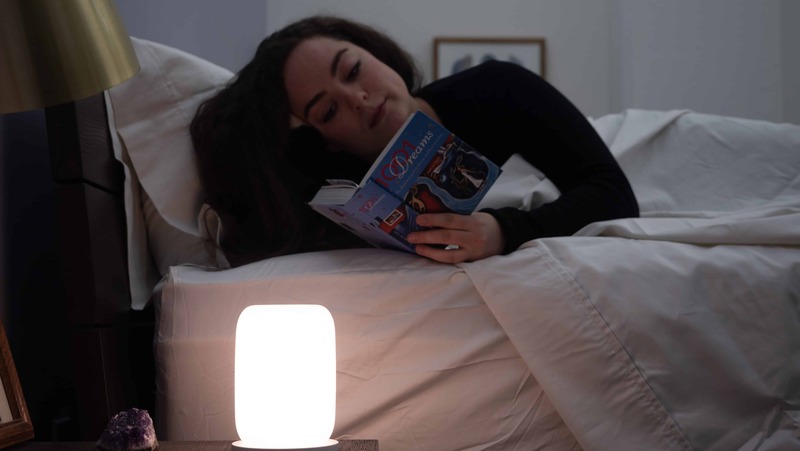 This smart bedtime light was designed to offer folks of all ages a customizable glow, uniquely calibrated to ease sleepers into dreamland. But how does it work, you ask? Well, Sleepopolis is here to investigate! The Glow light is a great addition to any bedroom, click this button to head to Casper and learn more! In this review, I’m going to show you everything you need to know about the Casper Glow smart light. We’ll take a close examination of how to set it up, how to use its many features, and how to sync it to your smart device. I’m pleased to report that the Casper Glow is very easy to use, and requires very little set-up. So, let’s go over what’s included with every Casper Glow, and how it works! Firstly, every Casper Glow comes with the nightlight itself, and a charging base. 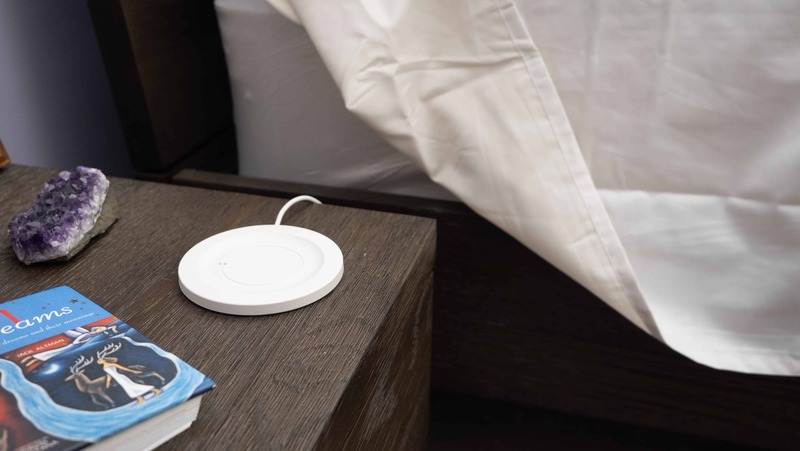 In my experience, the nightlight came charged and ready to go — but the folks at Casper say that you may need to charge it first to make sure it’s operating at full capacity. To charge your nightlight, all you have to do is plug your charging base into an outlet, and then place the nightlight on top of the charging base. About 15 minutes is all that’s needed to charge the Glow completely. Once it’s fully charged, the Glow will last for seven hours at full brightness. If you keep it on the dimmer side, the charge will last for a couple days — but I recommend you charge it consistently. Once it’s charged and ready for action, you can enjoy all of its fun features! To turn it on, flip the Glow upside down — this will activate its highest level of brightness. 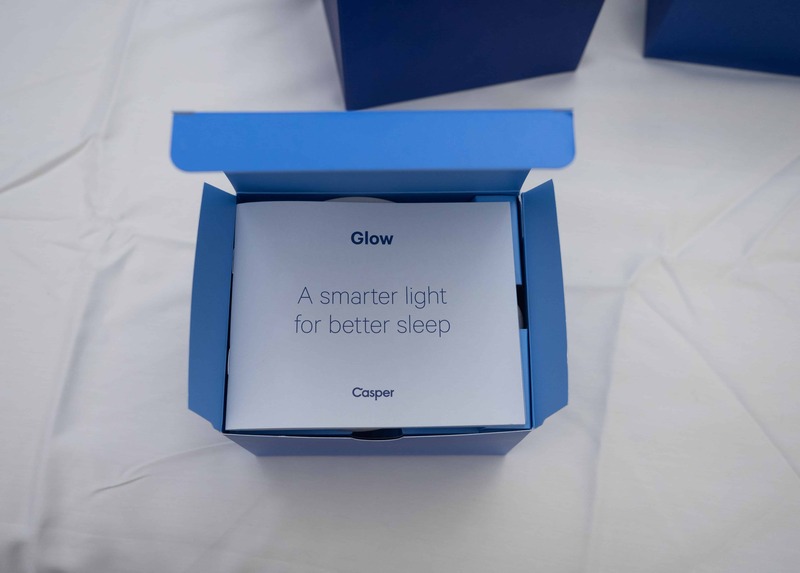 Sleepers can choose to leave it at full brightness and allow the Glow’s calibrated light sensor to gradually dim over the course of 45 minutes. Eventually, it will turn off on its own. The automatic dimming feature is intended to lull you to sleep, but should you want to adjust the brightness on your own, simply turn the Glow counterclockwise to dim, and clockwise to brighten. Additionally, if you want to pause the automatic dimming process, just press the button on either the top or bottom of the Glow. If you want to turn the light off completely, just flip it upside down again. To jump straight to the lowest light setting, give your Glow a little wiggle when it’s off. That will activate the dimmest level of light, and might be perfect for a little midnight-wandering when you need only a small bit of light to illuminate your way through the house. If you decide to take advantage of the customizable settings offered in the Casper Glow app, just download the app to your phone, and follow the easy on-screen instructions. If you’re unsure as to whether or not your phone is compatible with the app, just go to casper.com/glow-app. By using the app, sleepers can schedule a wake-up time (set a time for the light to turn on at full brightness), sync multiple Glows, and adjust the brightness settings right from your phone. And that’s it! Follow these instructions, and your Glow will be good to go. However, for you tech-minded folks who want to know more about the mechanics behind the Glow’s accelerometer and gyroscope, a detailed pamphlet illustrates all the inner-workings of this multifaceted nightlight. More: In the market for a new bed? 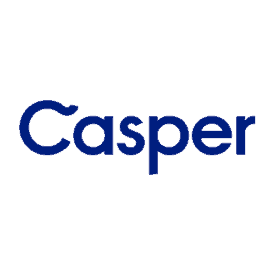 Check out our reviews of Casper mattresses! I’ll admit it: I’m not the most tech-savvy person around… So, I do tend to shy away from most products with the word “smart” attached to the label. However, this Casper Glow night light is so easy to use, and there are very few moving parts (which I love). Unboxing the Casper Glow was actually kind of a thrilling experience. I’m used to smart devices requiring at least some degree of set up before I’m able to enjoy them — so, imagine my surprise when this nightlight was already aglow the moment I removed it from the box. All I did was reach in, take the nightlight out of the box, and turn it upside down to examine it. Little did I know, turning it upside down is what turns it on (told you it was easy). I unboxed this nightlight in front of several onlookers, and as soon as the Glow lit up, lots of “oohs” and “ahhs” fell over the crowd. This nightlight is very appropriately named, in my opinion, as the warmth emitted from it really is more of a glow than a light. Sometimes, nightlights are a little too bright, or incorporate a blue light that can impede sleep quality. But the glow that comes from this nightlight is warm, inviting, and calming. Even if the Casper Glow did nothing but turn on, I’d still love it for the uniquely comforting light it provides. But here comes the cool part: it’s totally customizable. 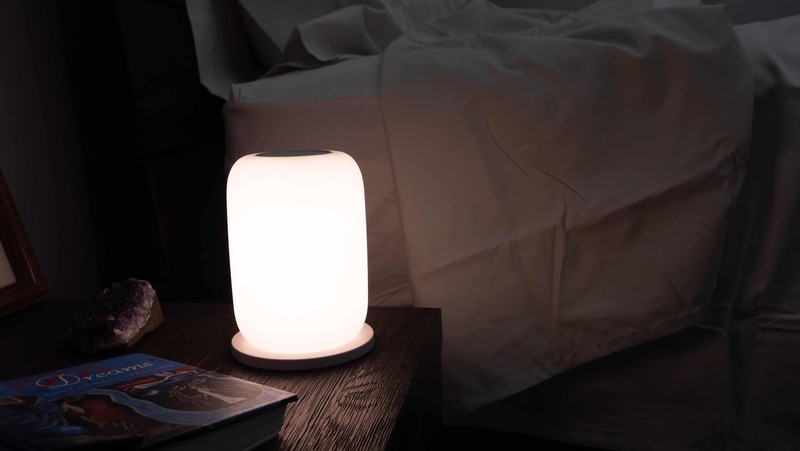 Place the Glow on your bedside table (or wherever you want it), and then turn it counterclockwise to dim it, and clockwise to turn the brightness up. There is no button-pushing or knob-turning required in order to customize the brightness of the Glow. Additionally, users can choose to sync this nightlight to the Casper Glow app on any iOS compatible smart device. You don’t have to use the app in order to enjoy the nightlight, but it does allow you to control the nightlight from afar. So, picture this: You watch your little one fall asleep on the baby monitor, and you want to turn the nightlight off without having to go into their room and risk an untimely wake-up. By using the app, you can dim or turn the Glow off with the simple tap to your phone. Another feature I thought was pretty clever is the “wiggle” feature. When your nightlight is off, you can pick it up and give it a little wiggle in order to activate the lowest light setting. According to the folks at Casper, this is ideal for some late-night wandering (you know, when you want to discreetly sneak to the refrigerator without being noticed). The Verdict: Two thumbs up. Between the warmly inviting light, the customizable settings, and the super simple set-up, the Casper Glow has officially upped the ante for nightlights. 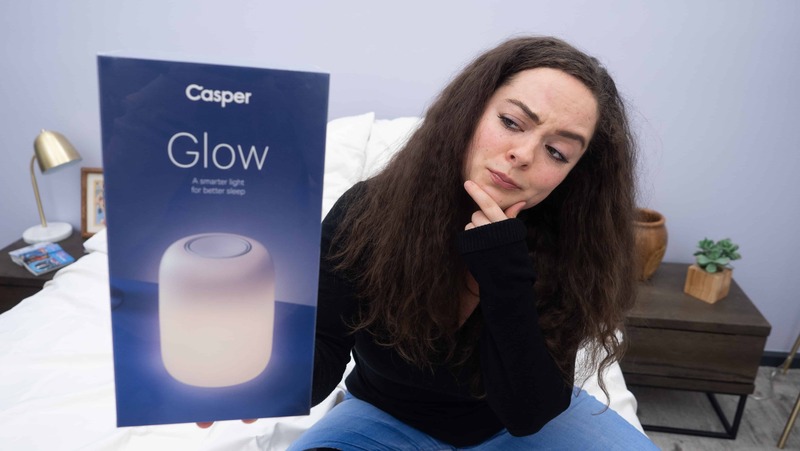 IS THE CASPER GLOW WORTH THE MONEY? Well, it’s no secret that I’m a big fan of this nightlight — but let’s go over some of its highlights again so you can determine whether or not it’s worth the investment! Easy to Use — The Glow was ready to use as soon as I removed it from the box. The folks at Casper say that, in some cases, you may have to charge your nightlight before using it. In my experience, though, it was glowing as soon as I turned it upside down. So, for those of you who are intimidated by the idea of complicated set-up instructions, take comfort in the fact that the Glow couldn’t be easier to use. Warm Light — The Casper Glow uses 2700K LED light which not only offers a radiant glow, but it helps you avoid the blue light that can be harmful to sleep quality as well. App Enabled — You can manage and customize this nightlight’s settings via the Casper Glow App (downloadable to any iOS or Android compatible smart device). The app allows you to sync multiple Glows, schedule a wake-up time, and (perhaps most importantly) dim the light without having to open the nursery door and risk waking your baby! I’ll be honest with you, gang: I can be a pretty scrutinizing reviewer, so I thought long and hard about the downsides to this nightlight. However, after exploring every facet the Casper Glow has to offer, I really did not encounter a single con. The design is sleek, the light is warm and inviting, the features are very cool, and (my favorite part) it’s so easy to use. Well done, Casper. This is the nightlight I’ll be recommending to everybody looking for a little bedside glow.